Editor’s note: On Tuesday night Renee Biggins was honored in a special center ring presentation. 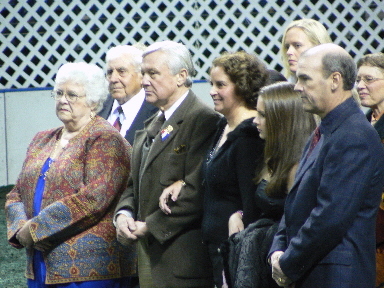 She was accompanied by her husband John, daughter Ashley, many other family members, and fellow UPHA members. While Edward “Hoppy” Bennett made the presentation (see below), a slide show with photos from throughout Biggins’s life kept the attention of the crowd. WWU President Jahnae H. Barnett also read a proclamation from the Governor of Missouri declaring it “Renee Capelle Biggins Day.” A reception for family and friends was held after the evening performances. and surrounded by family and friends. This is Championship Week. Throughout the American Royal Complex the talk is of Champions… ‘former’, ‘just-made’, ‘might-be’… and in that spirit, the American Royal Horse Show Advisory Board is pleased to honor Renee Biggins, a true champion and maker of champions, as our American Royal Horseperson of the Year. Renee brings to this horse show and to the industry those qualities that immediately distinguish a real champion: talent, perseverance, loyalty, and a high sense of purpose. She is undaunted by difficulties, unfailingly courageous, and deeply compassionate. 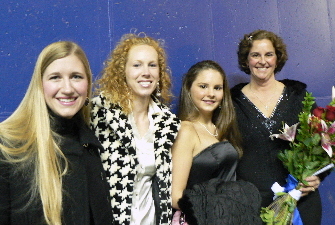 Renee’s accomplishments in the show ring as exhibitor and as teacher/coach are extraordinary, but it is her work as Chair of the UPHA Exceptional Challenge Cup for which we are especially grateful. She has pioneered in this field, forging new paths, creating new disciplines, and shaping new programming. Along the way she has facilitated life-changing individual accomplishments and brought joy and pleasure to many. With generous and essential support from Mary Gaylord McClean, Elisabeth Goth Chelberg, and Christine Kaplan the program has grown strong: it has brought honor to the UPHA as “the first professional organization to acknowledge and award riders with disabilities.” On Thursday night, November 16, Kansas City’s equine community will once again assemble to applaud these truly remarkable champions and their tireless Chair, our champion. But Renee’s life is far from one-dimensional. Born in Highland, Illinois to Marjorie and Paul Capelle, Renee is the fifth of their eight children, all of whom grew up on the family’s Merwin Morgan Farm. Renee’s equine interests and talents were nurtured and rewarded by her parents who allowed her to start and sell colts, applying her earnings toward her college fund. She was a standout in high school athletics, particularly in basketball and track, but her first love was always horses and she preferred working and riding at home to almost everything else. When the time came to choose a college, she chose William Woods University in Fulton, Missouri. There she was to have not only her first formal riding instruction but also her first experience with American Saddlebred horses. Mentored by Doc Backer and Gayle Lampe, her prodigious talent was soon evident and by her junior year she was invited to spend the summer in Fulton, working and campaigning William Woods’ horses at local shows. While still a student, she won the Five-Gaited Pleasure Championship at the American Royal on My Crown Royal, a college-owned horse. In the years since, Renee has dazzled Kansas City audiences with many winning rides including Carrigan’s Magic, Gypsy Supreme and in 2005, the grand gelding Boston Legal, owned by William Shatner. In 1983, with her William Woods diploma in her pocket, Renee embarked on her professional life. She was soon hired by Rob and Sarah Byers to assist at Rock Creek Riding Stables in Louisville and later, when they opened their own stable, Premier, in Simpsonville, Kentucky, Renee went along. There was much to be learned from Rob and Sarah about training and teaching, and Renee relished the opportunities in a “dream of a job” for nine great years. However, 1983 brought another “dream” possibility, for just as she embarked on her bright new career, she met trainer John Biggins, and in December 1985 they were married. On Valentine’s Day 1992, Ashley Lane Biggins was born and shortly afterward, Renee joined her teaching/training expertise with John’s, establishing what would become a partnership of extraordinary achievement. 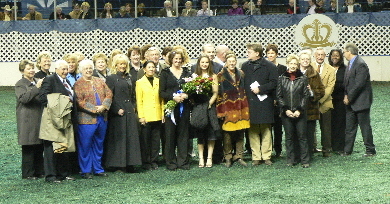 To her parents’ great joy, Ashley joined the ranks of Biggins Stables’ top exhibitor-competitors this summer with her 2006 Reserve World’s Champion of Champions on Simbara’s Cara Mia, her three-gaited pony. Since those early days, Renee has trained and shown nationally a remarkable string of Saddlebred horses, and she has simultaneously honed her teaching skills to ever greater refinement. Riders young and old, from all across the industry, seek her rigorous and thoughtful training. She relishes the opportunity to implement the teachers’ art, “mounting rider to horse” and coaching to new skill levels, greater expertise, growing confidence. In Renee’s hands the “art of teaching” soars to new heights. In 1997 Renee responded enthusiastically to Jane Bennett’s invitation to chair the UPHA Challenge Cup Equitation Committee and later, with comparable enthusiasm, to President Lonnie Lavery’s request that she start a Challenge Cup for riders with disabilities. She has more than honored both requests just as she has honored the UPHA American Royal National Championship as the privileged venue for this remarkable program. We are pleased to respond in kind by honoring Renee Capelle Biggins as the American Royal Horseperson of the Year.